This was our first Halloween together as a couple, and I thought hard about what would resonate with both of us. We watch old Simpsons reruns together practically every night, which is where the idea was born. Since the Homer/Marge duo has already been done many times over, we decided to go with bit characters – somehow more satisfying when people recognize you. We went to one party, and about a dozen people came up to us in full recognition of the characters. One drunk guy did ask me if I was Paris Hilton(??). 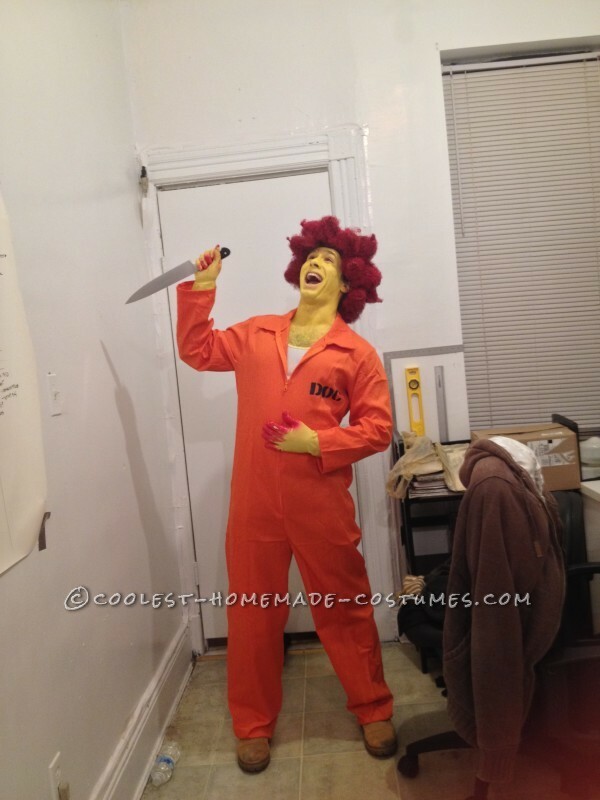 Sideshow Bob: pre-made convict suit. Large brown afro wig which we shaped into SSB-like dreads with Elmer’s glue and heavy file clips, then unloaded an entire can of red spray paint onto it. Bonus that the red paint stained his yellow gloves as well. There were a few minutes of panic when the just-sprayed wig blew off the roof of our apartment building (luckily our neighbor found it in their backyard). 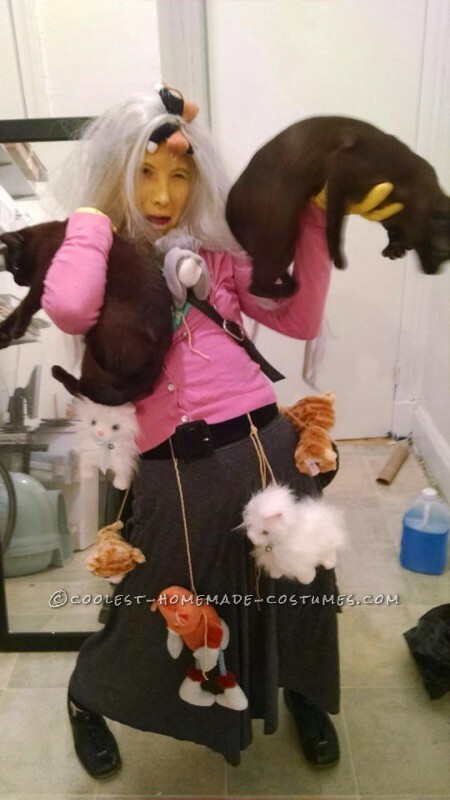 Crazy Cat Lady: Lots of stuffed cats from dollar stores, plus two fluffy white battery-operated cats that wiggle their feet/tails and meow (great dancing props), a life-sized cat phone (unfortunately not shown) in my pocketbook. My real cats not only made this photo, but helped with my wig – it was really nice when I bought it, so I dumped catnip all over it and let them attack it for a few hours.